Australian label Stylestalker was born from an addiction to fashion magazines and every day street style. It's a young, fresh brand that offers trend driven styles that are often influenced by catwalk, magazine and internet imagery, which makes it incredibly versatile and diverse. The line of dresses from the brand includes lots of ultra-feminine florals and lace, updated with contemporary fabrics like scuba. 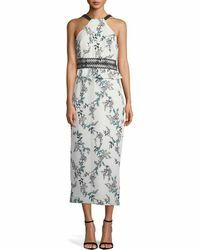 Lace panels, the use of prints and chiffon have all become signatures of the brand, which has also taken the cut-out and run with it on everything from maxi dresses through to plunging mini dresses.